I can’t believe that I’m actually typing this on a PlayStation dedicated site, but hot damn is it nice for my longstanding love affair with the Nintendo DS to finally pay dividends. At some point in 2006, long before my affections for console gaming had fully gestated, a weird little Japanese puzzle game found its way onto my DS. I’m not even sure the source, but it’s sufficed to say that I was addicted almost immediately. From that point forward, I played every single game in the Ace Attorney franchise, even going so far as to dip my toe into the odd crossover with the Professor Layton series. Yes, I’m fully willing to admit that I have a problem. Hopefully no one around here objects to my obsession, because I couldn’t wait to get my hands on Phoenix Wright: Ace Attorney Trilogy for PS4. Before we delve into the nuts and bolts of what exactly makes this game different from its prior forms, we should probably first explain what exactly an Ace Attorney game IS. In case you’re been living under a rock for the last fifteen years, Phoenix Wright: Ace Attorney and its subsequent sequels are puzzle novellas, set against a backdrop of the Japanese justice system. Helming the titular character, players are tasked with solving crimes and defending the rights of the wrongfully accused. Through keen observation, wit, and a little bit of luck, this budding lawyer is making his mark, one trial at a time. Though the series is supposedly set in the United States, the title employs a drastically dumbed-down facsimile of Japan’s court system. The setting is primarily due to choices made during the original release’s localization, but I’m willing to bet they somewhat regret that decision at this point in franchise’s history. Each trial takes place over the period of several days and are broken into courtroom and investigation phases. During the courtroom sessions, Phoenix sets about disproving the witness testimonies being brought forward by the prosecution. Inconsistencies can be uncovered by pressing the statements made on the stand and asking the witness to describe events in more detail. It’s critical to listen to each statement closely in order to detect any mistruths, regardless of whether they are intentional or accidental, and then pounce in with an “OBJECTION!! !” Then, using a piece of evidence from the court record, a critical item is presented by the player, thereby throwing the entire previous testimony into question. However, be careful to not make too many incorrect accusations over the course a day. Going down an incorrect path can result in the case being thrown out completely, resulting in a default “guilty” verdict. If any witness statements are deemed inaccurate, the judge will actually ask the person on the stand to either amend their initial statement or even offer up a new testimony entirely. These back-and-forth exchanges between the defense and witnesses continue until enough inconsistencies have been found to drive the narrative in a new direction. As additional details come to light, there can be dramatic shifts in the tone and tenor of a case, complete with a series of additional motives and suspects coming to light. At the point that the judge deems the current details of the case to be lacking, he will adjourn for the day. After the court portion of the day has concluded Phoenix begins the second stage of this dog and pony show: Investigations. Based off of the current operative theories in the courtroom, the player can then bounce around between several sites critical to the case at hand. At each location there are opportunities to interview potential suspects, dig for additional evidence at a crime scene, or scrape together additional details that could help turn the tide of the case. Once the extremely linear storyline has deemed every investigative avenue exhausted, the player is then allowed to progress to the next stage of the courtroom process. In many cases it’s hard to tell what exactly needs to be done in order to initiate this transition, which is an issue that haunts pretty much every installment in the series. The key thing to know is that once all of the details are in place, the player should have all they need to handle the proceedings of the following day. 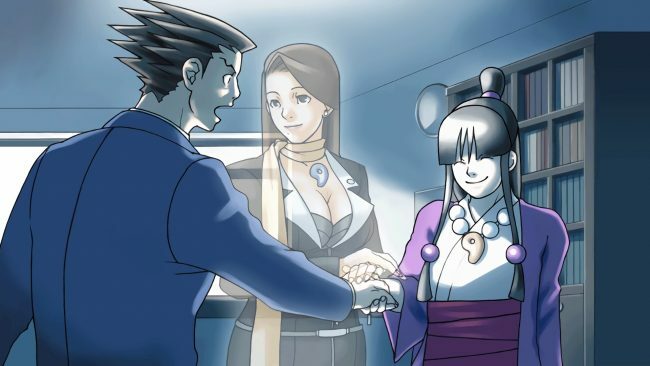 Regardless of how many times I’ve come back to the original three Ace Attorney games, (this is my third time, for those keeping track at home) I’ve always found them to be both compelling and challenging. Even when I know exactly what is supposed to happen next in the story, I’m still continuously caught off-guard amusing lines of dialog or entertaining turns of phrase. The writing is so damn good on such a consistent basis, it’s impossible to not be charmed into submission by the conclusion of any episode. Unless you have a photographic memory, there will always be moments in the storyline that present unexpected challenges. I most frequently encountered these scenarios when I couldn’t remember what needs to be done in order to progress along to the next key plot point. Sure, I understood where I needed to be going, but the trick was figuring out how the hell to get there. There are just so many miniscule details and minor interactions taking place at any given moment that it becomes overwhelming to try and wade through a sea of horseshit exposition, in order to find the one key nugget needed to bust a case wide open. 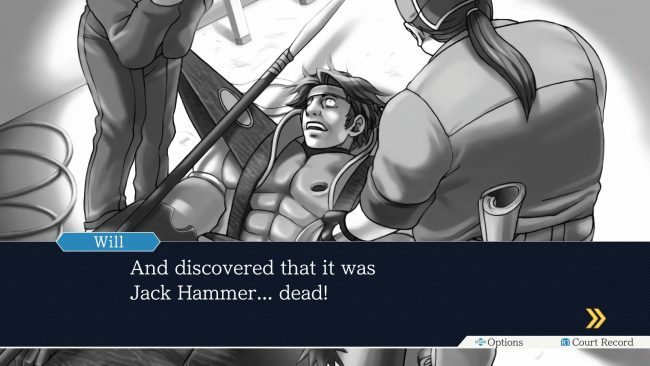 As is true in the case of all three installments featured in the Phoenix Wright: Ace Attorney Trilogy, the linear storytelling devices can prove to be rather obtuse. How exactly can a random picture from a witness’ past suddenly catch them off guard on the witness stand, resulting in them accidentally letting key details slip? Your guess is as good as mine! How the development team expects players to get past these shamelessly trial-and-error points is a bit beyond me. And this is even further compounded in situations where the judge puts the player on the spot, and an incorrect answer could potentially result in a default judgement. Mercifully, the save system is generous and even allows for saving in the middle of a day’s court proceedings. Without that, there would be several points where I could’ve lost an entire day worth of narrative progress, all because I was stumped by a particularly nasty bit of wayward cross-examining. And if there were still moments where I felt the temptation of looking up a walkthrough, even after numerous times through each game, I can’t even begin to imagine how a newcomer is expected to figure this garbage out on the first attempt. One last narrative trope that is indulged upon frequently is the last second swerve. It’s best to check all of your theories about a case at the door when entering the courtroom on the last day. Personally, I was a big fan of being thrown for a loop near the conclusion of a trial. However, the argument could also be made that this is a bit of lazy storytelling that not only obscures key clues, but in some cases withholds these critical bits of information entirely. Inevitably, final tidbits leak out during the concluding testimonies of a trial, usually tying up a majority of the loose ends in the process. These moments worked for me, but your mileage may vary. Despite how you may feel about the story, one thing is inarguable: It’s gorgeous. The collection’s HD treatment looks outstanding in 1080p and the contrasting color palette used throughout just pops on an HDTV. Now to rain on the parade a bit, it’s worth noting that this release is likely repurposing the HD assets that were originally created for the trilogy’s remaster on iOS, that released back in 2013. But who am I to look a gift horse in the mouth? The console installment of this same collection actually follows the same no-frills approach found on iOS. This is very much a bare-bones bundling of three classic titles, under the same roof. Don’t go in expecting any special content, documentaries, commentaries or behind-the-scenes material. The game is simply a trio of remasters for a fairly reasonable price tag. That said, when the same release could be played on iPad for slightly more than fifteen bucks, a thirty-dollar sticker price does look a bit less appealing. Would I rather see an HD collection stuffed with bonus content? Sure! However, given that the original version of this collection was just as minimalistic, I wasn’t expecting anything special. I guess we can just chalk this one up to Capcom missing out on yet another opportunity to celebrate their long legacy of excellent games. 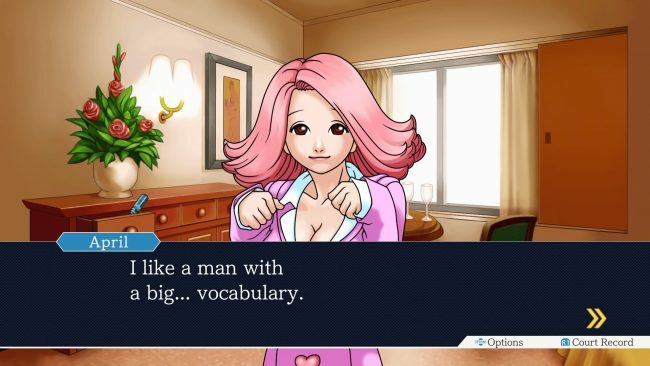 If you’ve never had the opportunity to indulge in one of this brand’s prior incarnations, Phoenix Wright: Ace Attorney Trilogy is a fantastic chance to explore your inner gumshoe. The amount of content delivered in this package will keep you gleefully badgering witnesses, in glorious HD, for far longer than the price would indicate. However, for those considering a second trip into the courtroom, you may want to consider if you hold high definition visuals at a premium. Lord knows that the game’s stellar writing will show through, regardless of the medium, so just make sure that this case doesn’t slip through your fingers. 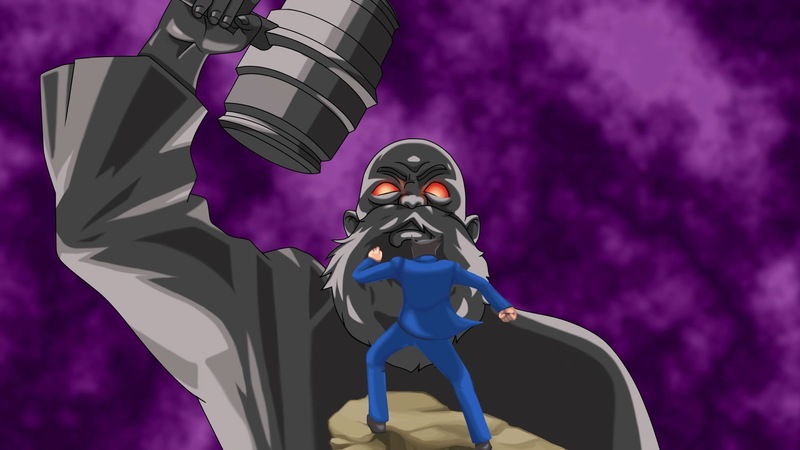 Phoenix Wright: Ace Attorney Trilogy review code provided by publisher. Version 1.0 reviewed on a standard PlayStation 4. For more information on scoring please see our Review Policy here.